It is well known that during posterior stabilization of the spinal column conventionally open methods are predominantly used. However, in this study a minimally invasive method was chosen to decrease the morbidity of the operative access and to protect the paravertebral musculature, which serves as an important spine-stabilizing factor during posterior stabilization. The aims of this retrospective non-randomized case-control study were to compare the clinical and radiological results of minimally invasive on the one hand and conventionally open posterior surgery on the other with each other and to measure the loss of correction after purely posterior stabilization. 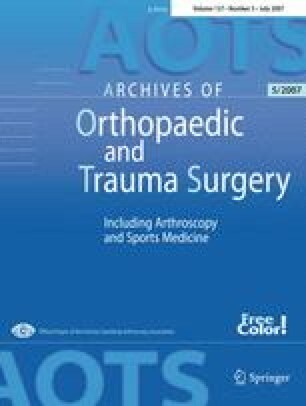 Twenty-one consecutive non-randomized patients with thoracolumbar vertebral body fractures, which had been stabilized posteriorly without any intervertebral body fusion between 1996 and 1997, and without any neurological symptoms, were examined retrospectively more than 5 years after trauma. Eleven patients had been treated conventionally open and 10 patients minimally invasive. As methods of evaluation, the intra- and postoperative amount of blood loss, the X-ray time, the Hannover-Spine-Score, the SF-36 Health Questionnaire and radiological assessment of the bisegmental wedge and vertebral body angle were made use of. The blood loss was significantly lower among those patients who had been operated in a minimally invasive way. The operating time, the time of X-ray exposure and the loss of correction were identical in both groups. The first year after implant removal, the loss of correction was the highest with 2.1° for the body angle and 6.86° for the bisegmental wedge angle. Neither in the Hannover-Spine-Score nor in the SF-36 Health Questionnaire did both groups show a difference. A correlation between the loss of correction and the clinical results could not be demonstrated. The minimally invasive posterior stabilization leads to lower blood loss in comparison to the conventionally open method and can be carried out without any special effort limited to A-fractures without any neurological symptoms.